The Man Booker Prize is surely one of the most influential of literary awards but also one of the most controversial. On a good year, the panel of judges will line up six cracking good reads and generate lively debate about the merits and standards of contemporary writing. In a bad year they’ll give the prize to some utterly incomprehensible twaddle like John Banville’s stinker ‘The Sea’ and leave baffled readers switched off for another year. 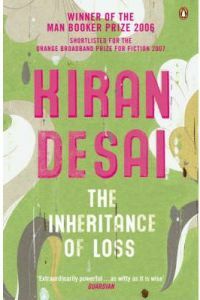 So which camp does Kiran Desai’s ‘The Inheritance of Loss’, the winner of the 2007 prize fall into? It is a readable classic or just another dust gatherer? For me it’s a definite thumbs up but given with the reservation that it certainly won’t be to everyone’s taste. Kiran Desai was born in Delhi and lived in India until she was 14 when her family moved first to the UK and then a year later to the USA. Like her female lead character she was convent-educated and like one of her characters, she experienced hostility and alienation when moving to a new country. Her mother is the highly respected author Anita Desai and it’s inevitable that comparisons between the two will be drawn. Whilst both write books that are long on description and relatively short on plot, the writing style of the two is quite different as are the themes covered. At 35 years old, Desai was the youngest woman ever to win the prize and was already highly acclaimed in literary circles for her first novel ‘Hullabaloo in the Guava Orchard’ which won a Betty Trask award when it was published in 1998. She spent a massive eight years writing this latest book which, whilst the book IS very good, is still an exceptionally long gestation for a book of 300 and some-odd pages. Much has been made of the parallels between the book and Desai’s family history but it’s not an autobiography. Desai herself has said that in places it’s about experiences within her family – such as the experience of immigration and going back to India. I can only assume that researching the family and political history has contributed to the lengthy writing process. Otherwise, sorry dear but what took you so long? The Booker judges called ‘The Inheritance of Loss’ a “radiant, funny and moving family saga and has been described by reviewers as ‘the best, sweetest, most delightful novel’”. So what’s it all about? A retired Judge was quietly and grumpily living out his days in the shadow of the giant Himalayan mountain, Kanchenjunga. His companion was a much-loved dog called Mutt – probably the only living being he really cared about. Born into poverty in Gujerat, he had won a place at Cambridge University which, at the time, had been an almost guaranteed ticket to a ‘good job’ with the Indian Civil Service. He had no money for his fare and was only able to go to England by attracting the attention and financial support of a wealthy social climber who wanted his daughter to marry a man with a big future. Therefore, he married the girl, pocketed a generous dowry and a ticket for the ship to England without her. On returning from Cambridge – a place where he felt totally isolated and very foreign – he found his wife too ‘Indian’ and sent her back to her parents, where six months later she produced a daughter. When that daughter was subsequently killed with her husband in Russia (they were involved in the space programme, which should have been an interesting theme but wasn’t developed at all in the book), their only child, Sai, was left with no other living relative. The Judge grudgingly agreed for her to come and live with him in his ramshackle home in the mountains. The other key player in the judge’s household is the cook – another outsider from a different region of India. All his hopes are riding on his son Biju, who had the good fortune to get a tourist visa for the USA and left to make his fortune. Instead he found only illegal, underpaid work in the kitchens of a succession of New York restaurants. Biju struggles to buy into the American immigrant dream and is confused by the ‘made good’ Indian Hindu business men eating ‘rare’ steaks in one of the restaurants where he worked. Back in Kalimpong, the Judge hired two elderly ladies – Lola and Noni – to tutor his granddaughter. These old girls clung to the old ways – with their M&S undies and pride in Pixie, Lola’s daughter who works for the BBC. They soon found they couldn’t cope with Sai’s maths and physics tutoring and drafted in the help of a local Nepali man, Gyan, who became gently but romantically involved with Sai. Other minor characters who each in some way share the sense of ‘loss’ alluded to in the title include Father Booty (a Swiss priest who runs an unlicensed dairy) and Uncle Potty. Everyone is in some way alienated by their environments and experiences, clinging on to aspects of the colonial past whilst not belonging entirely to the ‘old ways’ and not fitting in with the new. The novel is set in the 1980s not long after the assassination of Indira Ghandi. This isn’t a period I knew anything about as the focus of most contemporary writing about India tends to be either around the time of independence and partition or more recently. The backdrop to the action in the novel is political unrest in Kalimpong where Nepali Ghurkas are campaigning – at first quite quietly and then with increasing force – for an independent Ghurkaland. The uprising brings a new wave of change to the main characters as conditions become significantly worse and much of what they’ve come to take for granted is brought into doubt. Desai has been condemned by local people in Kalimpong for portraying them as ignorant and violent and for being condescending. There’s nothing quite like a good book burning on a cold mountain night! Having been to other areas of the Indian Himalayas I loved the descriptions of daily life in Kalimpong and I was able to clearly picture the surroundings. I also valued (rather than enjoyed) the exploration of the behaviour of the post-colonial well-to-do and their blindness when faced with the challenge of adapting to change. One of the old sisters comments about the rise of Chicken Tikka Masala as the British national dish which I felt was out of place. Whilst it’s true enough today I don’t think that would have been the case in the early 1980s. Even though the plot wasn’t strong, I wanted to keep on reading because of the strength of the descriptions of Indian life. If you have no interest in India then I’d suggest that maybe this isn’t the book for you – without the setting, the story would struggle to carry a reader along. I also have to say that I haven’t read the other five books yet but I’ve certainly read much better books from previous years that haven’t won. Maybe she struck it lucky this year – but there’s nothing in this book that could hold a candle to anything Rohinton Mistry has been listed for. The page-space given to the main characters is quite balanced but if forced to identify two ‘main characters’ I would say they were Sai, the Judge’s granddaughter, and Biju, the cook’s son. Biju was probably the character I developed most respect for but at times it wasn’t easy to care very much about most of the other characters – they are stubborn, unlovable, set in their way or, in the case of Sai, in need of a good slap to get her out of her dreamy romantic torpor. As a romantic suitor, Gyan, the tutor, is poor stuff – he and Sai call each other ‘momo’, the name for a small Nepalese filled dumpling. ‘The Inheritance of Loss’ has a growing sense of despair and decay as if the people, like the houses they live in and the property they own, are succumbing to the damp and mould of a monsoon season. The novel lacks a firm sense of where it’s going but that’s not untypical for Indian novels and doesn’t necessarily count against it. I kept looking for pointers that would signify the next big plot development but there really weren’t any – the tale just plodded along in its own beautifully-written but not very exciting path. It’s a beautifully constructed book that gives you a warm satisfying feeling that you are reading something of merit but it’s also an exceptionally melancholy tale – nobody is happy with their lot, everyone is missing something fundamental in their lives and suffering some form of ‘separateness’ that leaves them dissatisfied. It’s a tale of great regrets for things done and things not done, sometimes many years before. No Comments on "The Cook, the Judge, his grandaughter and her lover"